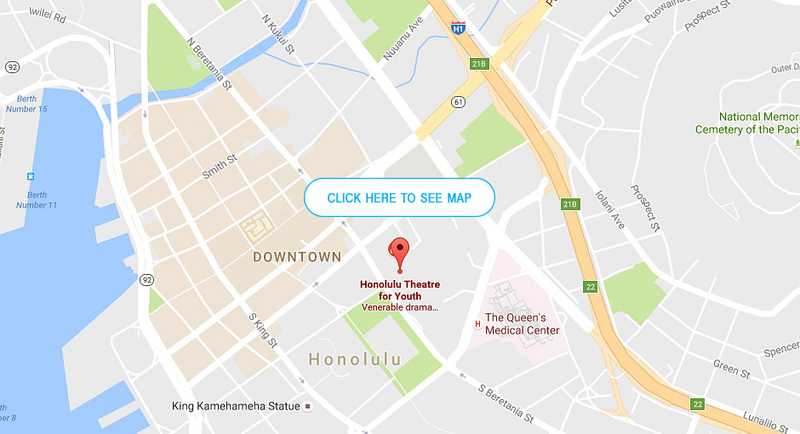 Tenney Theatre is located at St. Andrew’s Cathedral on the North-East corner of South Beretania Street and Alakea/Queen Emma Streets in down-town Honolulu. The parking lot has entrances on both Beretania and Queen Emma Streets. H-1 Koko Head/East bound From all points heading East into town, take exit #21B/Punchbowl Street. Proceed through King Street and turn right on South Beretania Street. Pass the Governor’s Mansion and turn right into St. Andrew’s Cathedral parking. H-1 Ewa/West bound From all points heading West into town, take exit #22/South Vineyard Blvd. Turn left onto Punchbowl Street and turn right on South Beretania St. Pass the Governor’s Mansion and turn right into St. Andrew’s Cathedral parking. Parking is generally available in the lot in front of Tenney Theatre facing Beretania Street. Parking is FREE for patrons attending HTY Family performances. FREE parking is not available for HTY School performances. Additional parking is available on the surrounding streets or in the lot at Alii Place. Please be sure to allow sufficient time to find parking when planning your trip to the theatre. We are grateful to St. Andrew’s Cathedral for allowing us to make Tenney Theatre our performance home.